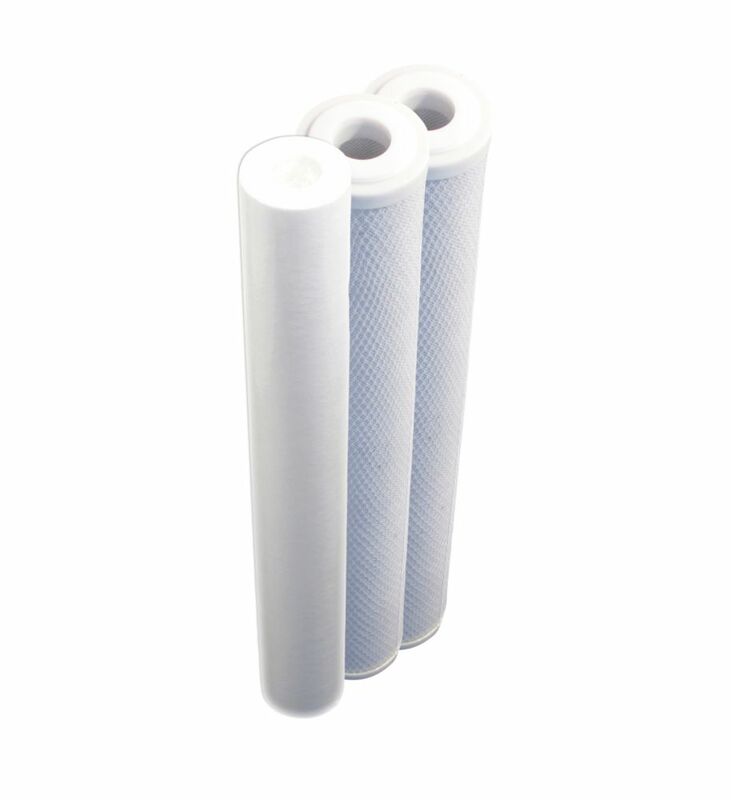 The UF-15 replacement filter is compatible with the Coral UC100 under counter water filtration system. The UF-15 filter is tested and certified by WQA (Water Quality Association) to NSF/ANSI standards 42 & 53 for the reduction of Chlorine, taste and odour, Chloramine, Particulate Class I Particles, Cysts, Mercury, Lead, MTBE, Turbidity, Asbestos, and a full list of VOCs (see our Performance Data Sheet for the full list of contaminates reduced). The UC100 filter system has also been tested and certified by WQA according to NSF/ANSI 372 (low lead compliance) and CSA B483.1 (Canadian requirements). Coral's UF-15 filter is designed to last 6 months with a 300 gallon capacity. The Brondell H2O+ Cypress Carbon Block filter (HF-33) is the final stage in the advanced Cypress filtration system. The Carbon Block filter further reduces particulates, bad tastes and odours, and water contaminants such as chlorine and harmful volatile organic compounds (VOC's), improving the taste of the dispensed water. The HF-33 filter significantly reduces harmful chemicals like Atrazine; Chlorobenzene; Trihalomethanes; Methoxychlor; Endrin; 2,4-D; Benzine; DBCP and 98% of Aesthetic Chlorine from your tap water for a healthier home and family. Choose Brondell H2O+ for better water. CasaWater under sink water filtration system designed to reduce a wide range of contaminants, improve taste and door and controls bacteria and viruses in the water you use for drinking, cooking and washing fruits and vegetables. The ultra filtration (UF) membrane provides disinfection while conserving the mineral equilibrium of the water. If you are a handy person, the installation would not require a plumber. CasaWater whole house stainless steel water filtration system provides purified water at every source in your house. The water filtering process consists of several stages dealing with numerous contaminants such as: dirt, sediment, rust particles,etc; chlorine, bad taste and door, lead and heavy metals, etc. ; organic chemicals, etc. ; common bacteria, viruses and spores, etc.